So trust me when I say that I wasn’t expecting much from them and therefore I was totally and delightfully surprised at how much I enjoyed TOWER HEIST. Sure, the actual heist is pure screwball in planning and execution but the cast is so good and are all obviously having a terrific time that I didn’t care. TOWER HEIST, like “After The Sunset” is a Brett Ratner movie that feels as if he’s telling a story about characters he cares about. Unlike the “Rush Hour” movies that feel like pure product. Josh Kovacs (Ben Stiller) is the manager of The Tower, Manhattan’s most expensive and exclusive condo skyscraper. He’s extremely good at his job and is adored by his staff. Among them, his brother-in-law Charlie Gibbs (Casey Affleck) who is the building’s concierge. Enrique Dev’reau (Michael Pena) the elevator operator. Odessa Montero (Gabourey Sidibe) a Jamaican maid who needs to find a husband to avoid being deported. Lester (Stephen Henderson) is the building’s head doorman who is looking forward to retiring after many long years of service at The Tower. Josh is also very buddy-buddy with the building’s most famous tenant: Wall Street billionaire businessman Arthur Shaw (Alan Alda) who owns the penthouse. They play chess by computer and Josh plainly looks up to the older man as a father figure. That image is shattered when Shaw is arrested by the FBI for running a Ponzi scheme. Shaw’s lost over $2 billon, including the pensions of The Tower’s staff as they all invested their money with him. Placed under house arrest by the FBI agent assigned to his case (Tea Leoni) Shaw maintains his innocence but when one of the Tower’s staff attempts suicide, Josh is determined to get their money back. He recalls that sometime ago, Shaw had his condo extensively remodeled. He thinks it’s because Shaw used the remodeling to cover up having a safe installed in the condo. Josh plans to break into the condo, get in the safe and hopefully get back the money The Tower’s staff lost. A reluctant Charlie is enlisted, as is Enrique, Lester and Odessa. They’re joined by Mr. Fitzhugh (Matthew Broderick) a Wall Street investor himself who’s gone bankrupt and has been evicted from The Tower. The last recruit is Slide (Eddie Murphy) a small-time thief who is understandably dubious about the whole caper. The heist is set to be pulled off during the Macy’s Thanksgiving Day Parade and as I said earlier, it is a totally screwball heist as everything that can go wrong, does go wrong with results that are both hilarious and nail-bitingly suspenseful. The story is one that is extremely timely, given the current financial crisis in the country and goes a long way to selling the movie’s premise. Alan Alda is great in his performance, playing Shaw as a man totally indifferent to the havoc he’s created in people’s lives. Casey Affleck is pure comedy gold and this is yet another performance that further reinforces what I’ve been saying for years; that he’s a better actor than his brother Ben. Eddie Murphy hasn’t been this good in years and for me it was a pleasure to see him truly acting and not hiding behind tons of makeup and fat suits. Gabourey Sidibe continues to prove that she deserves to be taken seriously as an actress and she’s not just a one-movie wonder. And it’s always a pleasure to see Tea Leoni in a movie. Why this woman doesn’t have a bigger career is a mystery to me. I could go on and on but for once I won’t. 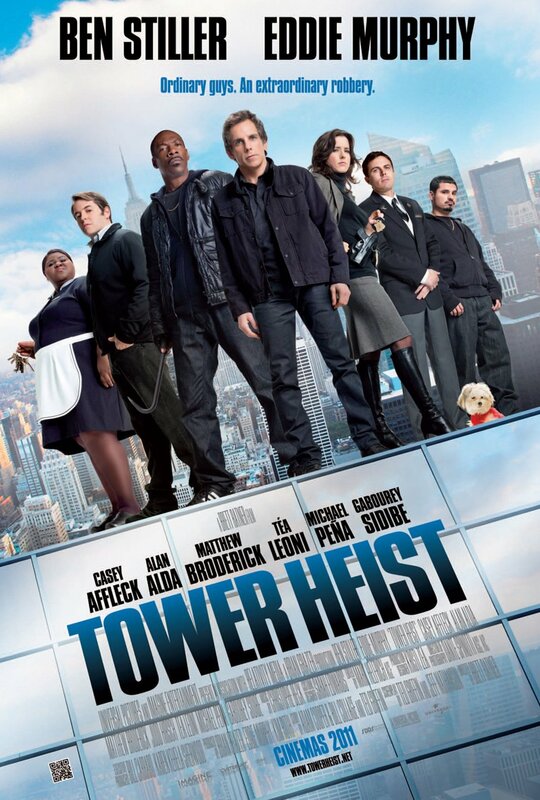 Just watch TOWER HEIST. Trust me, it’s good. I always like your reviews, and they’re steered me towards some pretty good movies so far. If Gabourey Sidibe had never done a movie after Precious, I would still hail her as an incredible actress. Absolutely. “Precious” is a role and a movie that Gabourey Sidibe could easily have coasted on and made a whole career out of. I was delighted to see that in TOWER HEIST she stepped up and easily held her own in a comedic role with comedy pros like Murphy and Stiller.